By Mary EschSister Jennifer Votraw is director of communications for the Ogdensburg Diocese in northern New York, where the Mohawk reservation is located. While the diocese doesn't provide direct pastoral care to the Mohawks, Votraw belongs to the order the Sisters of St. Joseph, nuns who regularly aid the priests who minister to the tribe. She said years of successful interactions between the church and the tribe demonstrate a mutual respect for each other. By Wab KinewYet even as indigenous North Americans are celebrated by the church, there are signs the embrace could go further. During his remarks, the Pope noted that although Saint Kateri "worked, faithful to the traditions of her people," she "renounc[ed] their religious convictions." 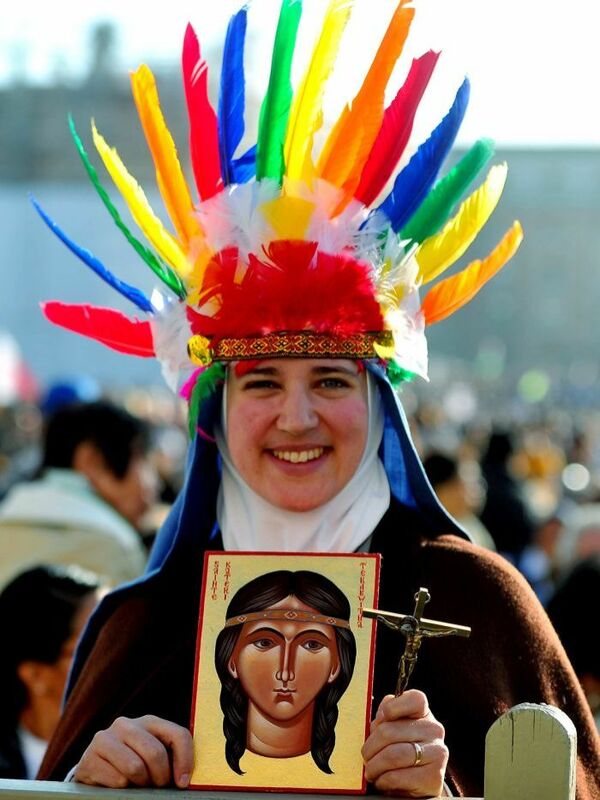 The church views indigenous cultures as merely a host for the Catholic religion. This approach is called "acculturation" by Catholic missionaries. As one priest explains in the new film In Her Footsteps: The Story of Kateri Tekakwitha, acculturation is the process where the local culture becomes like a "prism" through which the "truth" of the gospel is revealed. Talking to many of the indigenous people at the canonization ceremony, many of them residential school survivors, I don't think this is what they have in mind. They speak of embracing Catholicism, but also of practising their traditional spirituality. It is precisely this pluralistic approach that made the inclusion of smudging and indigenous language so important to them. It is that same reason that motivated so many of them to wear their traditional clothing to Vatican City. As Chief Littlechild says: "We can have both spiritual beliefs, although it's the same great spirit and the same Creator." There was much talk from church officials this week about how Kateri's sainthood opens the doors for new forms of evangelism. Pope Benedict himself called for a "renewal of faith in the First Nations." This misses an opportunity. The truth about reconciliation is this: It is not a second chance at assimilation. It should not be a kinder, gentler evangelism, free from the horrors of the residential school era. Rather, true reconciliation is a second chance at building a mutually respectful relationship. While the Vatican may not yet treat it as such, many of the Aboriginal delegates in Rome this week do. They speak about new beginnings, healing and moving on. In a quiet courtyard in Vatican City at a post-canonization reception, Littlechild says, "I've forgiven, even more now, I think. For myself, the experiences that I've had, but also for my family. "Comment: The basic question here is whether the Church has embraced the idea of respect and partnership with Native cultures. Or whether the Church thinks the good little Indians should give up their pagan practices and join a "real" religion.